Is Rehlat offering this service directly? No, We are not offering this service. We have partnered with Blue Ribbon Bags or BRB to offer our customers the assurance on baggage handling by paying a nominal fee. I can handle my baggage. Why should I sign up for BRB premium baggage service? 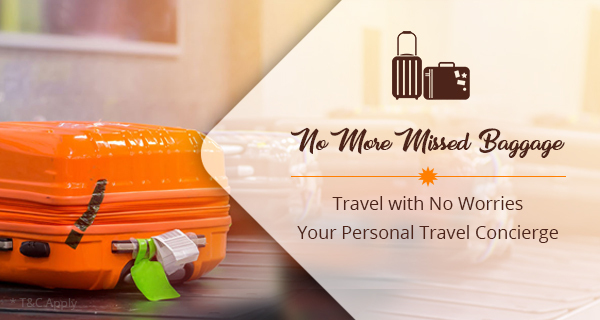 When you are travelling, any unforeseen scenarios like missing of baggage or delay of baggage should be the last thing on your mind. However, it is difficult to ignore this aspect, as airlines handle baggage of hundreds customers and may sometime misplace your luggage. To remove the stress out of travelling, all you need is Blue Ribbon Bags (BRB)’s baggage protection. It just takes one single phone call or email that the company will swing into action and take care of your luggage. I have round trip tickets booked. Is this service applicable for both ways then? Each purchase is per person per Airline Confirmation Number. If you have booked a round trip ticket under one airline confirmation number, your complete trip baggage assurance is covered under this & this is regardless of how many stopovers the flight involves. But if your outbound and inbound flight are booked under different PNR, then separate BRB package has to be purchased. I am flying out of Muscat. Do you offer service for my flight? Yes, we offer baggage tracking and locating services for flight everywhere in the world. There is no restrictions on origination or ending location. How can I file a claim if my baggage is missing? Should I contact you? File a Mishandled Baggage Report with Blue Ribbon Bags within 24 hours of your flight landing. Please note that report filing can be done 24 hours a day, 7 days a week. Fill this form to file missing of your baggage. Form Here. You can also call on +1 888-224-4243. The tracking process is expedited post this and you receive automated mail notification informing you the status of your bag/bags. Once you file a missing report with Blue Ribbon Bags, do not contact the airline further. BRB will take care of complete process. Blue Ribbon Bags will either find your bag within 96 hours of the flight landing or will send you the guaranteed amount one minute after the 96 hour deadline expires. It’s been more than 2 days. Can I report my missing bag report with Blue Ribbon Bags (BRB)? No, You cannot. Please note that the missing baggage report has to be filed within 24 hours of flight arrival. Also, ensure that before reporting missing baggage to BRB, please report it to airline. Payments are processed on completion of 96 hours of missing baggage report filing. I have received my payment from BRB but now I got my luggage too after 5 days. Do I need to pay back the amount? No, once the payment is proceeded, it is yours even if your bags show up at any point after the 96 hour deadline is over. My bag is stolen at the airport just after arrival. Can I report this to BRB? Theft, Missing Items, or Damaged baggage is not included in the service. The BRB coverage applies to baggage mishandled by the airline only. I paid through my credit card. How will I get my amount from BRB if my baggage is not found after 96 hours? The amount is credited back to your card from which you had paid. In case of difficulties, the BRB customer contacts you on registered email and phone number. My flight is cancelled. Can I get my money back I gave for BRB service? If your flight is cancelled and a new flight is booked in its place, you must inform the change prior to your new flight's departure or purchase a new service for your new flight from BRB. The BRB service is non-refundable and non-transferable. No refunds or credits will be issued. Any queries, concern, or question, drop an email to info@blueribbonbags.com with your service agreement number in the subject line. Write the airline and airline confirmation number, your original flight number and the new flight number (if any change) in the body of the email. If you are completing changing the airline, you must inform the airline name your new flight is on. I forgot to give my address when reporting the missing baggage. Where do I get my baggage? If a delivery address was NOT provided to the airline when filing the report, BRB will close your case once the bag arrives at the designated airport on record with the airline, and your bags will be considered returned per the Blue Ribbon Bags Service Agreement.